Embroidered Satin Materials designed and combined. I started out with a pattern but due to my dyslexia had it all mixed up. I spilt the sides with the embroidered black material and lined the dress. It brought a stunning WOW! 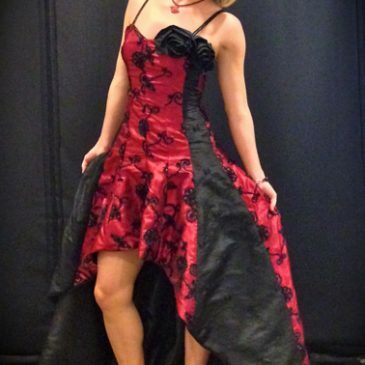 when Sarah, the Tri City Fashion Employee/model wore it out on the stage! !